Blast away unsightly gunk, goo, and crud. 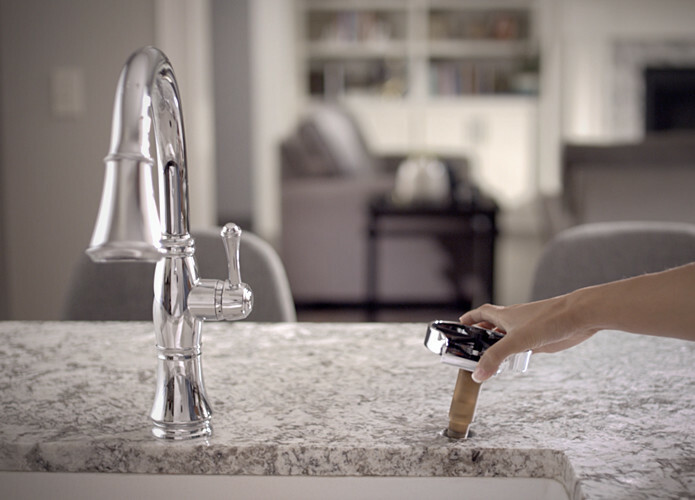 The Glass Rinser is an ingenious new gadget from the people at First Wave—the innovation lab inside Delta Faucet Company. It solves the age-old problem of hard-to-clean residue by powering it away before it dries. Or, if you’re old school, the First Wave Glass Rinser makes it easier than ever to wash items by hand. Simply add a bit of dish soap to your dirty item, then press it down on the rinser. Boom. It’s clean in no time. 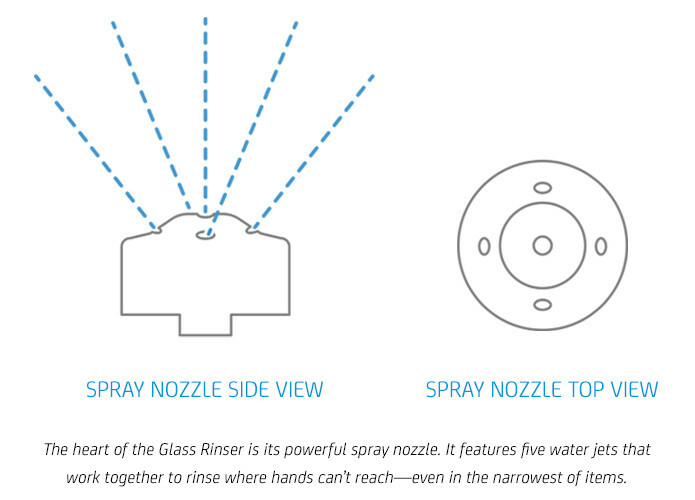 The Glass Rinser installs easily to your cold or hot water supply line. We recommend using hot water if you plan on using your Glass Rinser to handwash items. You push downward. Water jets upward. Simply push your glass, water bottle, or any other hard-to-rinse item down on the spring-loaded pad. As you do, high-pressured water blasts up to rinse where hands can’t reach. • Mounts in a standard countertop hole. • Makes rinsing easy. Or, add a bit of soap to your dirty item for easier handwashing and disinfecting. • No on/off switch. Simply push down for powerful rinsing action. • All spray nozzles are centrally located. Perfect for narrow items. • Powerful spray nozzles power away residue. • Easy to install. Just mount to sink and connect to a water supply line (we recommend using hot water, especially if you plan on handwashing items). • Rinses an incredibly wide array of cups, bottles, and glasses. Today’s insulated bottles keep water cold all day long. And that’s certainly handy. But they’re quite narrow—and therefore difficult to clean. Glass Rinser to the rescue. Its water jets are centrally located, so they’ll rinse your items effectively, no matter how narrow they are. That’s handy. Especially for items that’s aren’t dishwasher safe. It’s easy to install. And love. 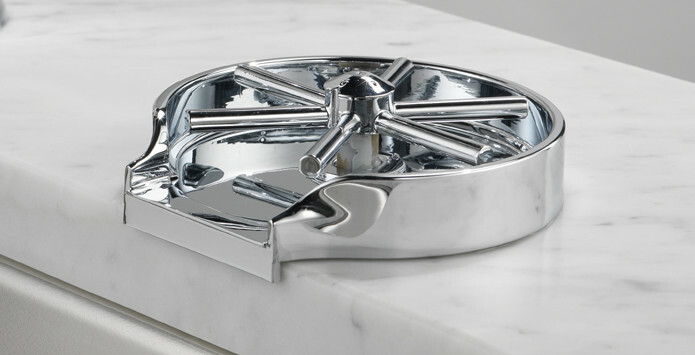 We designed the Glass Rinser to fit a standard countertop mounting hole—the kind commonly used for faucets, sprayers, and soap pumps. 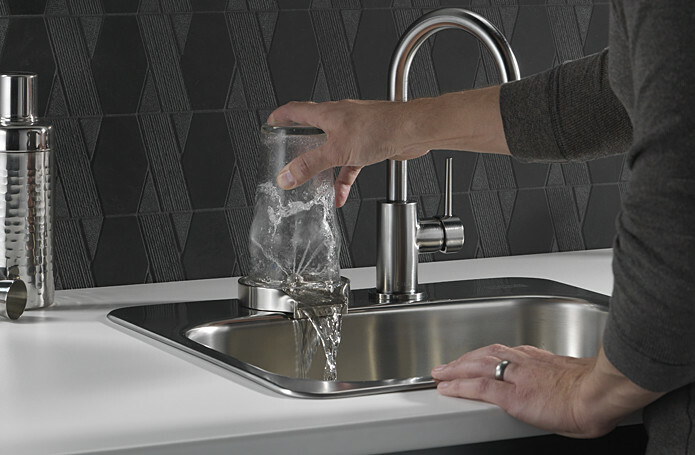 Simply mount to your counter and connect to a water supply (hot water, if you plan on using your Glass Rinser to handwash items). Just like that, you’re up and running. 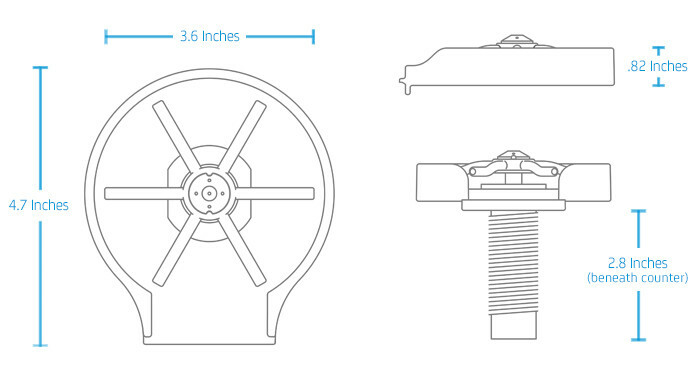 You probably already have room for a First Wave Glass Rinser. It’s the perfect replacement for an old countertop soap pump. Or if you’re upgrading to a single-hole faucet configuration, you can install a Glass Rinser in a vacant countertop slot. The Glass Rinser comes in two finishes. Ideal for home bars, too. In search of the perfect pint? Install the First Wave Glass Rinser in your home bar and use it to give pint glasses a quick rinse before pouring your next hoppy IPA—just like the pros.